Plastic Sheds have increasingly become popular due to their low maintenance and durable qualities. In our guide, we explain the benefits and models offering the best value. The answer should be fairly easy in theory but the more research you do the more complex the answer seems. Over recent years plastic sheds have become an increasingly viable alternative to those made traditionally with timber or the low maintenance option of metal sheds. David Coton explains the advantages of choosing plastic initially and then looks at some of the leading brands. With the development of modern plastics, the durability of this type of shed has increased considerably. With excellent specifications and build quality, there is now a huge choice to suit everyone's requirements, whether this is for storage or to create a working or living environment. One of the main reasons why people choose to buy a plastic shed is that they are maintenance free. There is no danger of corrosion, rot or warping, and to guarantee the shed remains in pristine condition all that is required is occasional washing with warm soapy water or jetting with a domestic water pressure cleaner. These highly developed plastics are now very unlikely to crack, their colour shouldn’t fade noticeably over time, and any solvent and paint spills can be normally wiped away with no long term damage. The HDPE or PVC vinyl and plastic used in today's sheds has been developed to be extremely durable within the normal extremes of weather typical to us here in the UK. This means they are watertight, weather proof and UV resistant. All your gardening equipment, chairs, cushions and other items that are stored will remain perfectly dry. In most cases plastic sheds are developed for use in America, Australia and other climates that are far more extreme than ours. We sometimes think we have the worst weather in the world in the UK but in truth it is not extreme, just very varied. During winter months the roof of a plastic shed can easily withstand heavy snow and, when it melts, the water just runs off the outside rather than permeating through as it might with a timber shed with a damaged or worn felted roof. However, please remember that all plastic sheds must be anchored to a firm foundation to protect against wind damage. We don’t live in a Hurricane Belt but Storm Doris was pretty feisty. Although very functional and practical, plastic sheds are available in a number of contemporary styles as well as the more functional traditional designs. They can also be used as a playroom or an outside office for example. Plastic sheds, by their very nature, are more easily and quickly assembled than most metal sheds so it might now be time to have a look at what's on offer and let a plastic shed help make the most out of your storage or living issues by utilising space in the garden. Plastic Sheds are sure to become even more popular in the future, and here we answer some of your frequently asked questions. What Is PVC and HDPE? In simple terms they stand for Polyvinyl Chloride and High Density Polyethylene. PVC and HDPE are economical to produce, strong, and very resistant to chemicals and sunlight. PVC shed panels are very sturdy and won't warp or bend. Is Corrosion Or Breakdown A Problem? No, which makes plastic superior to wood and metal both of which over time will inevitably rot or corrode. 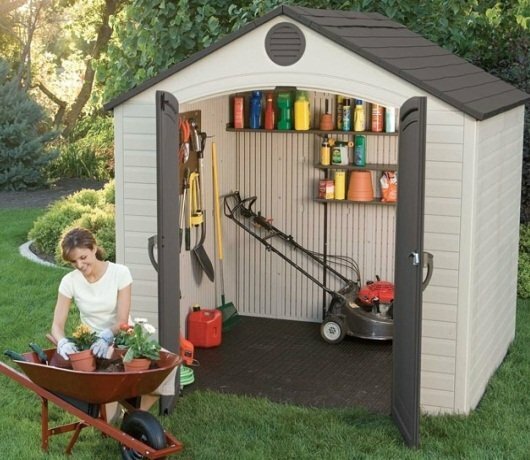 Are Plastic Sheds Both Weather And UV Resistant? Yes, the colour of a shed is unlikely to change due to weathering and the PVC and HDPE will not crack in strong sunlight. Condensation in plastic sheds is certainly less of an issue than it is with metal sheds, particularly if you choose one of the more modern twin walled plastic sheds. In all cases a solid level base of flagstones or concrete which has a damp proof membrane laid underneath is your route to prevention. Many plastic sheds have their own integral plastic floor which also helps. Some moisture may well be sucked out of the surrounding area initially but it will not develop into a long term issue. None of the plastic sheds that we have on display suffer from condensation issues. Do You Need To Use Preservative? There is no need for any preservatives or paint. Yes, although every so often you may need to wash off any everyday grime that has collected. How Light Is It Inside A Plastic Shed? Don't worry, depending on the model you choose, many have windows and skylights that let in plenty of light. Some people choose not to have windows for security reasons. 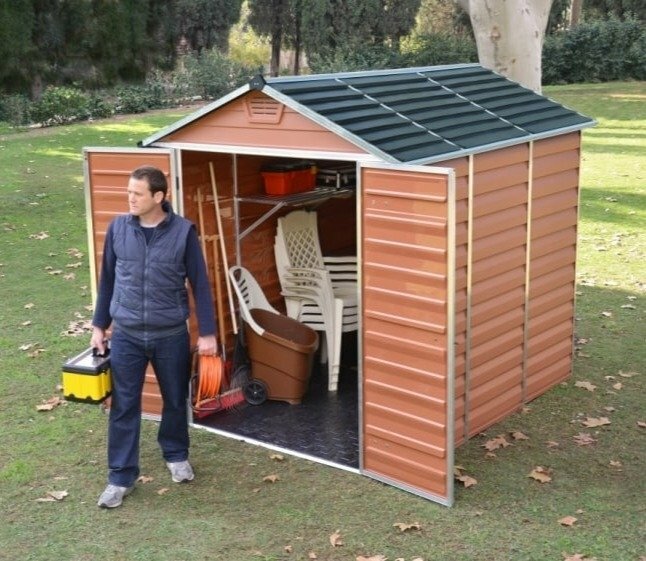 Yes, they are very easy to assemble, requiring a minimum amount of tools, when compared to metal sheds. That’s not to say they will take several hours to install and we never recommend installation on a windy day. Sheds are practically 100% recyclable and require no stain or paint. Are there Plastic Structures Other Than Sheds? There's an impressive range of storage facilities, summer houses, garages, even gazebos made out of modern plastics. What Ranges Are Available in the UK? GardenSite stock plastic sheds and other structures from all the major manufacturers, including DuraMax, Palram, Keter, Grosfillex, Suncast and Lifetime Plastic Sheds. They are all excellent quality and we sell with complete confidence as they will serve you well for many years. Plastic sheds are not always the cheapest option if you are looking for economical storage solutions. Let’s take a closer look at these ranges in more detail to illustrate the depth of choice. Suncast are manufactured in the USA and recognised worldwide as a premium brand. Whatever your requirement, Suncast has got it covered in their impressive range. From deck boxes to large sheds, their collection of plastic structures and accessories is nothing less than very impressive. All their glazed sheds are well lit and ventilated with the 7ft wide 'Cascade' having a side as well as front windows, while the slate coloured 8ft wide 'Tremont' and 6ft wide wood grained 'Everett' benefit from skylights. Whatever the style, the build standard cannot be faulted with blow moulded resin, double walls, and an extremely strong reinforced floor. The 'Conniston' models are the smallest Suncast sheds, They are essentially sturdy vertical storage facilities particularly useful for long handled garden equipment and other tall items. Very secure and weather proof they are ideal for locking away valuable tools. The 'Conniston Two' is particularly interesting as most of the construction is cedar wood with just the floor and roof made from resin. The doors have cast aluminium handles and this Suncast shed is an appealing option if you favour a 'natural' look. 'Kensington' sheds are horizontal, so good for storing cushions, tools and gardening accessories. There are seven different sized options from 20 cubic feet upwards. All of them have superb access from the front and top. Thoughtfully designed, they look attractive with restrained colours blending easily into the garden landscape. Taking everything into consideration, Suncast's maxim is that you might have a hundred things to store but there's only one place to store them would be hard to dispute. Lifetime Plastic Sheds is another well respected American brand. 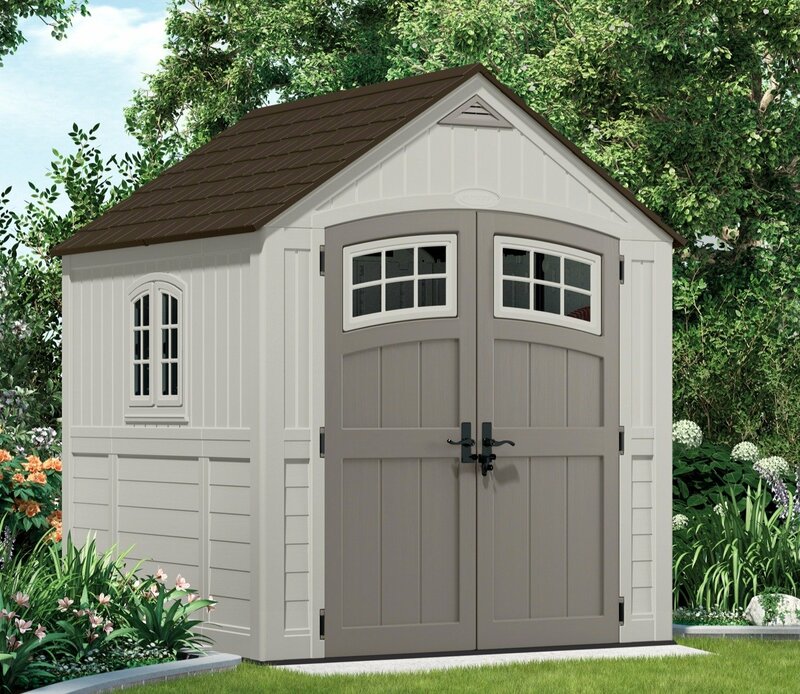 Manufactured from high-density polyethylene with concealed steel reinforcements for added strength, their comprehensive collection of sheds varies greatly in size from modest storage units to imposingly large structures. All Lifetime garden sheds have a steeply pitched roof for efficient water drainage. Perhaps most notable are their 11ft wide sheds which have a choice of six lengths from 11ft up to a massive 26ft with optional shelving and other accessories. Other superb sheds are 10ft and 15ft wide double fronted structures with great front access, in some versions, there is also a single side entrance. Not only are these sheds massive inside but they are also very attractive from the outside. They are very robust with both skylights and windows providing effective illumination. 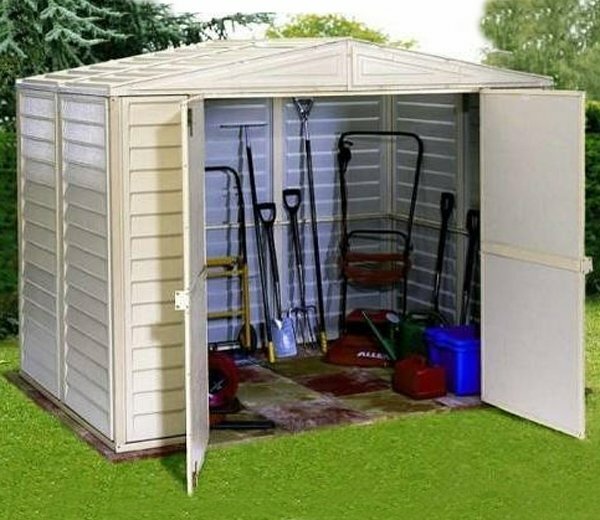 More compact heavy duty sheds are 7ft and 8ft wide versions, these are useful to store all sorts of garden equipment, with generous headroom they are well ventilated and the 19mm floor is oil, solvent, stain and slip resistant. Dependent on the model, skylights and / or a side window are included. All weather vinyl cladding in the shiplap style, reinforced by galvanised steel, characterise DuraMax sheds that offer straightforward assembly with all parts pre-cut, drilled and numbered. Designed in America, they are manufactured in Dubai. In addition to several compact secure stores, there are three 8ft wide 'DuraMate' sheds up to 10ft long, and three 'Woodbridge' versions that are 10ft wide. Their interiors are lit by a skylight, there's a window kit as an option and double hinged doors offer easy access. The smallest 'Woodside' shed, at 4ft x 6ft, has a single door while the two larger versions boast double doors. Depending on the size, there are side and front windows. Skylights add to the very pleasant internal environment and vents promote excellent air circulation. The DuraMax range has particularly good fire ratings so is often specified if this is a major consideration. Highly practical, Palram's range of fire resistant sheds stretches from the 'Voyager' lean to which will fit into anyone's garden up to the very impressive multi-purpose Skylight 8ft by 20ft structure. 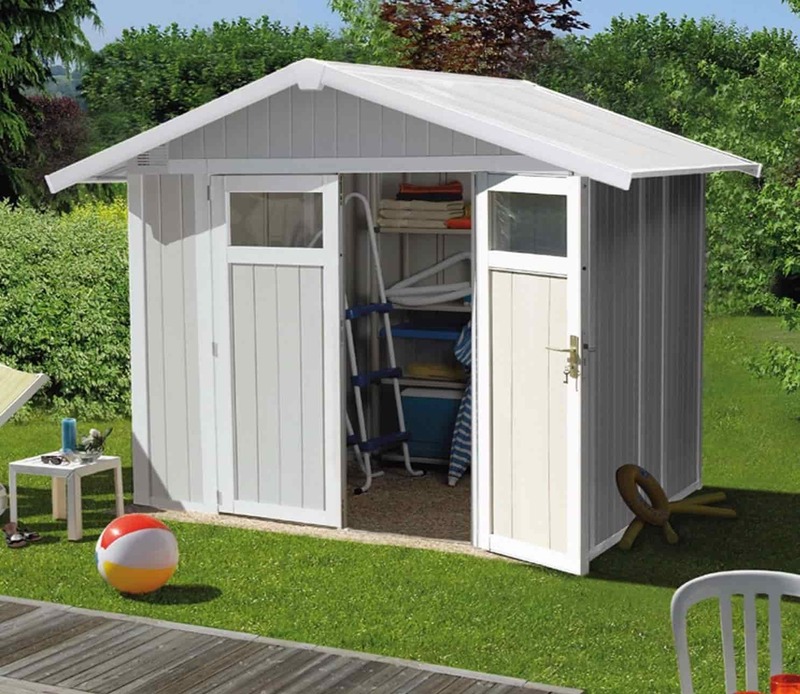 With a choice of amber or anthracite finish, these sheds are virtually unbreakable featuring polycarbonate panels that are exceptionally durable. Based on a robust and corrosion free aluminium and galvanised steel frame, the apex sheds have a unique skylight roof that illuminates the interior with soft natural sunlight while filtering out harmful UV rays. Easy to assemble Palram sheds are built using a slide and lock panelling system and represent a very affordable and quick way to increase your storage space. Grosfillex garden buildings offer characteristic French style, with elegant designs and pastel colours that blend harmoniously into the landscape. Made from long lasting, robust and very hardwearing PVC, there are two designs to choose from, either 'Deco' which has ample glazing to allow for leisure use or the more storage orientated 'Utility' version. Sizes vary from 4.9m² up to 11m² for the standard models which all have double doors for excellent access, and there's also the very impressive 20m² 'Deco' building that has a lovely porch area large enough for a table and chairs. A number of accessories are available including a storage unit and tool hangers, and a canopy can fitted to the exterior for shade or in case of rain. Weatherproof, UV resistant, maintenance free, quick and easy to install, Grosfillex products are reinforced with metal struts with the result that they are extremely sturdy as well as simply elegant. Keter are perhaps the best known brand in plastic buildings and this is because they have been pioneering their use for many years and they are known as an innovative company that produces great value for money and high consumer satisfaction for the sheds and storage units that they manufacture. The Oakland is a low maintenance shed that uses steel to reinforce and strengthen the the innovative DUOTECH™ walls. They feature a weathered wooden texture that means they look very harmonious in a garden setting without surrendering the durability of the high grade resin that is used. Remarkably these walls are easily paintable if you want to blend in with an existing colour scheme or simply want to add a splash of colour. The Oakland uses pre-cut T&G panels to help with the ease of construction and the natural look of the building. Wide double doors, a heavy duty floor which is ideal for storing heavy items and a high roof that supports up to 100 kg/sqm of snow are all standard features. The Fusion range, as the name suggests is a clever fusion of different materials which combine to create a unique shed that is beautiful in appearance but durable in the workplace as it resists rot, rust and general decay from the elements. The key element is a unique wood plastic composite that is paintable and can even be drilled for fixing internal shelves. This combines into a thick double wall structure that sits on a heavy duty floor for handling heavier items. Two great plastic sheds from Keter, without question to add to the significant models already highlighted from other key manufacturers. Now the ranges have been explained you simply have to decide on the budget that you have, what you want to use the plastic shed for, and how visible it is going to be in the garden. These three questions will help you make the right choice for your needs. Read a selection of our verified customer reviews. Like the shed, good size, well built. Bit worried if it was going to be flimsy but seems very sturdy plastic once assembled. Good value for money. Excellent product which provided you study the instructions is easy to put together. Delivery very good & comes in flat pack box so can be stored until you are ready to assemble. During assembly you may feel the finished product will be a little flimsy but this is not the case - once fully assembled the shed is very sturdy. The best bit is the fact that once assembled you never have to stain it as it is completely maintenance free. Thought this shed looked good in the picture and is even better than I expected. A male friend put it together on his own - about two hours, and it is exactly as advertised, even sturdier than I thought. Love it and would recommend it as it looks lovely as well!